Kodi has become the choice of millions to stream their favorite video content online due to the sheer number of video add-ons that it provides. However, nothing is more disturbing than the scenario when your movie, TV Show or video watching experience is ruined by certain errors. Kodi users are also facing certain stream authorization errors such as vshare.eu/pair, openload.co/pair but lately, a new stream authorization error has come into picture known as flashx.tv/ pair or https://flashx.cc/pair. The issue has recently started affecting the Kodi streaming experience of thousands of Kodi users. A majority of the users are looking for a solution to this stream authorization error on various Kodi forums and websites, but to no avail. Are you utilizing Kodi on an Android Box? Know the steps to update Kodi on your Android Box from here. 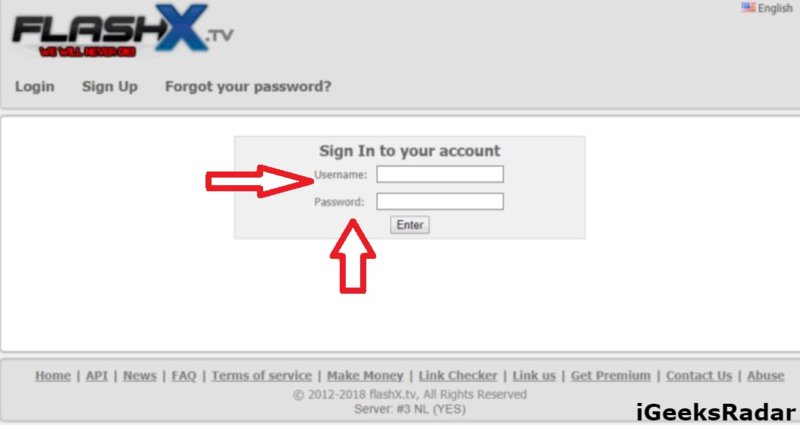 But, there is, absolutely, no need to worry as, in this post, we are going to share with you working methods to fix flashx.tv/pair or https://flashx.cc/pair stream authorization error on Kodi. However, before you move ahead, it is mandatory for you to know as to what exactly a flashx.tv/pair or https://flashx.cc/pair stream authorization error is. What is flashx.tv/pair or https://flashx.cc/pair – Flashx Pair Stream Authorization Error on Kodi? 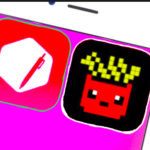 In reality, the Flashx Pair is introduced by the Kodi Developers itself, in order to avoid the interruptions that were haunting Kodi users in the middle of their video streaming experience. It is the latest technology that makes your Kodi software to work exceedingly well and eliminates all the possible issues that could occur while utilizing various Kodi Add-Ons. Hence, from this, we can infer that flash.tv/pair is not, actually, an error but a way to provide you a smooth and interruption-free Kodi usage experience. The only way to fix this error is to pair your Kodi device with flashx.tv/pair or https://flashx.cc/pair. Running Kodi on Firestick, Fire TV or Fire Cube? Know the steps to update Kodi on your Fire Device from here. [How-To] Pair Kodi Device with flashx.tv/pair or https://flashx.cc/pair? The procedure of pairing Kodi with Flashx pairing is slightly different than vShare EU or Openload.co pairing process. 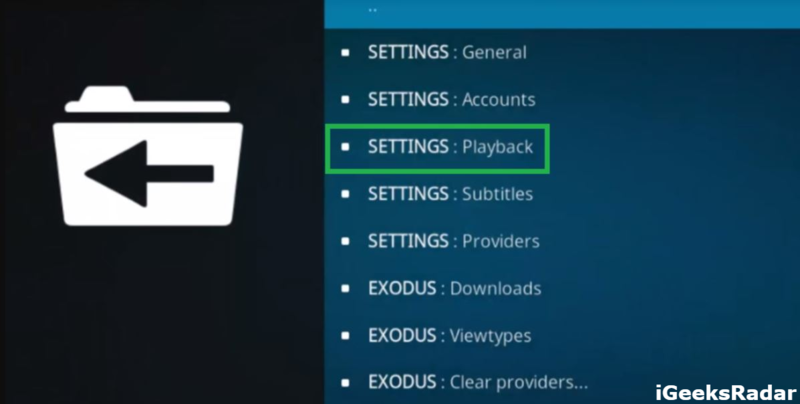 Please follow the below given steps carefully in order to pair your Kodi device with flashx.tv/pair or https://flashx.cc/pair. As a first, please launch Kodi software and from the home screen please select any of your favorite Add-Ons. Next, you require watching a movie or a simple video from the Add-On which you have selected. However, your movie or video won’t play as usual. Instead, you will get a list of different servers which are available in your location. You, simply, cannot move ahead without selecting any one of the available servers. From this list of servers, you require selecting Flashx.tv/pair. Now, try watching the selected movie from that server. 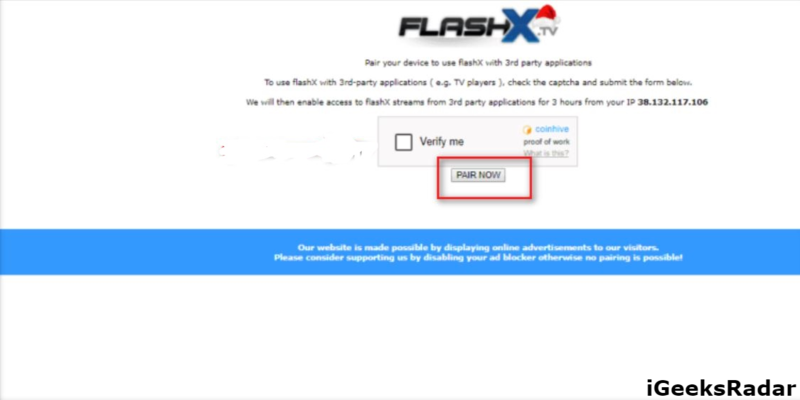 However, you will get a new pop-up of flashx TV pair stream authorization error stating that in order to play this video you require undergoing stream authorization. Now, you must pair your Kodi device’s IP address with the Flashx pair IP address. For this, please launch a new browser and navigate to https://flashx.tv/pairing.php. Once the webpage loads up you require registering yourself with Flashx using the Sign Up option. However, if you already have an account you can simply click on Login and enter your account credentials. For signing up, please fill all the information that has been asked like User Name, Email, Password, Country etc. Post-filling in the entire information, you will receive a ‘Verification Mail’ on the email id that you provided. Open the mail and tap on the ‘Confirmation Link’ to confirm your account with Flashx. Again, you require navigating to https://flashx.tv/pairing.php. Now, on the webpage, you will see the option of ‘Verify Me.’ Please solve the captcha and tap on ‘Pair Now’ button present just below the Captcha and you will get to see a blue colored tick mark. 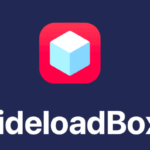 Finally, a pop-up will come up stating that “Pairing is Successful.” Now, you can go ahead and watch your favorite movie without the Flashx interruption in between. 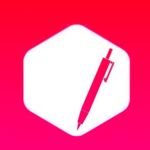 “Download Latest Cydia Impactor to Sideload iOS Apps on Windows & Mac“. Please note that in the above-discussed method you require pairing your Kodi device’s IP Address with Flashx every 4 hours. In between, if you turn off your internet connection or change your IP Address then you require redoing the entire procedure. However, you needn’t create a new Flashx account. Following methods provide a permanent fix to fix the flashx.cc/pair stream authorization error. Interested in downloading Kodi on your iOS device? Check the steps here to install Kodi 17.6 Krytpon on your iOS device. As a first, please Open your Kodi device by tapping on the Kodi Logo. Tap on ‘OK’ and you are done. When you have deactivated the option of ‘Hosters with Captchas,’ Kodi won’t pick up any video that runs on a stream that presents us with captchas. 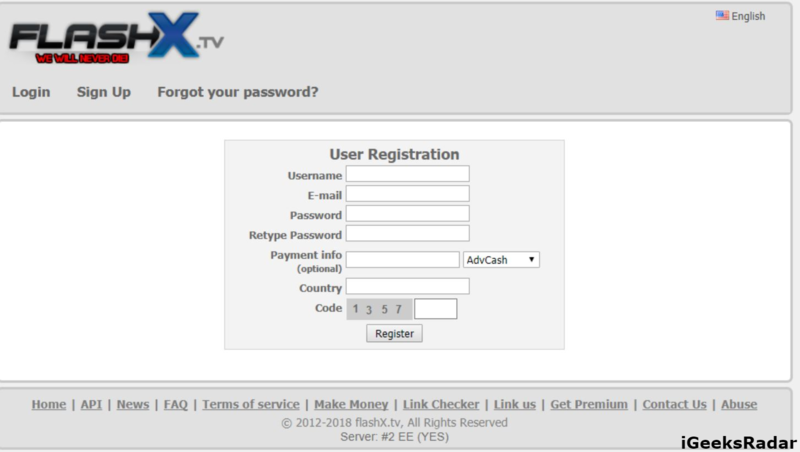 Hence, in this way, you will be able to avoid the flashx.tv/pair error altogether. 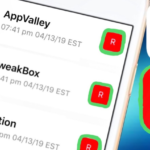 “iPhone XS Max Jailbreak on iOS 12.1 Archived by KeenLab [Full Guide]“. Please launch Kodi and navigate to Video Add-On. Right-click on any Add-On and choose Settings -> Configure. From here, please select the option of ‘Provider’ and you will be able to see a list of providers in this. From this list, you need to untick the option of ON-SERIES. Great! You have successfully remove Flashx provider from Kodi. Is it Necessary to Use Flashx.cc/pair on Kodi Device? Millions of users are utilizing Kodi software. Lately, the traffic is becoming too much to handle. Hence, to sustain this traffic the Flashx.cc/pair service has been introduced. Hence, you require pairing your Kodi device under Flashx.cc/pair in order to enjoy a smooth performance and to watch your favorite videos without any sort of errors or interruptions. So, these were the ways in which you can pair your Kodi device with Flashx.cc/pair and fix the Flashx pair stream authorization error. In case you are facing any issues with the process, please let us know about the same in the comments section provided below and we will help you out. For any questions that you might have, please use the comments section itself. Install Multiple Kodi Builds on Fire TV, FireStick & Android Box. Kodi 18 Alpha 2 Released for iOS, Android, Windows, MAC & Xbox One.